Posted December 3, 2014 by Dr. William Myers & filed under General Dental Articles. Several things can keep you from visiting the dentist every six months as normally recommended. A bad experience, a fear of the dentist, finances, or maybe you’re just too busy. However, when you make the decision to get back in the dental chair, you may still feel reluctant. The team at my Warsaw dental office wants to ease your concerns and help you understand what you can expect at your first visit. Your first visit after a hiatus will typically warrant a longer visit. This isn’t to scare you but because we like to spend time getting to know our patients personally and familiarizing ourselves with their mouths. We’ll also perform a thorough evaluation that will most likely include x-rays, a comprehensive exam, and cleaning. We’ll move at your pace and constantly ensure that you’re at ease. 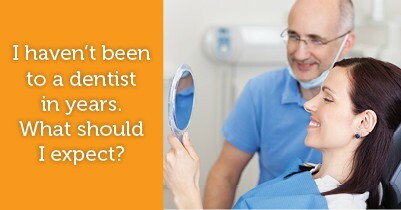 If it’s a been a few years since you’ve seen a dentist, there is a good chance that you have some decay and cavities. However, they’re nothing to fear. Most people, even those who do see the dentist every six months, get several cavities throughout their lifetime. But thanks to improvements in dental technology, treatment is easier, less painful, and faster than ever before. Getting a cavity filled is a much better option than leaving it untreated as a cavity that is left to fester can lead to more serious problems. Whether it’s been a few months, years, or decades since you last visited the dentist, we’re here to welcome you to my dental office in Warsaw. Our goal is not only to get your mouth healthy, but to make sure you’re comfortable and that you’re an active part of your health care team. We welcome you to talk to us about your concerns so we can help ease your worries and get your smile back to health, beauty, and strength. Welcoming patients from Warsaw, Winona Lake, Leesburg, and surrounding areas.